I’m feeling a whole lot better, and it’s all as a result of a few pretty simple things…. • This morning I got my tax return done. It’s one of those things I hate doing, and will procrastinate about forever if I can. So this year I decided to take the bull by the horns and rang my tax agent way back in early June to make an appointment for the end of July. That way, I had no choice but to get my act together. • Instead of doing the washing and vacuuming, I played in the kitchen and tested out a new recipe. Hmm. I won’t say it was a flop, but it’s definitely a work in progress. Ah well, trial and error is the only way to perfect these things…and at least I had some fun. • I took Coach’s advice to train if I felt up to it, but to rest if I didn’t. I decided that a rest was really in order. • I saw my doctor and had an annoying spot on my forehead frozen (bye-bye Fugly!). Oh, and I got a thorough check-up re the belly pain too, of course. No diagnosis, but a couple of things to try, and she doesn’t think it’s anything dire. It’s probably one of those mystery things that will never be explained, but will disappear and not bother me again. Kind of what I already thought myself, but having a professional medical opinion confirm it – even a “probable” - lifts a load off my mind. • I also received some lovely supportive messages from some very caring people via blog, Facebook, email and phone, and that was probably the best medicine I could ask for. So thank you, you’re all awesome! As a result of all of the above, I’ve had a subtle but significant mindshift back to the positive side. Funny how just one or two little seemingly minor events can tip your equilibrium one way or the other. It's all in the way you look at things. 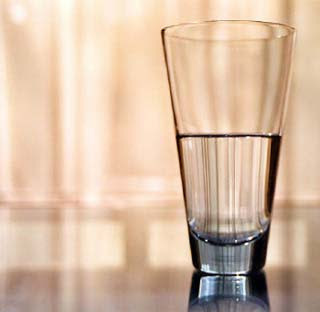 Same glass, same water level - but is it half-empty or half-full? A good sleep in makes so much difference. Good to see that you are not being so hard on yourself.